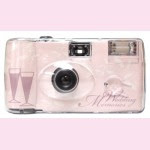 Avonlee Photography: Disposable Cameras - Are They Worth It? Disposable Cameras - Are They Worth It? This question keeps popping up on both bride's internet sites and in my meetings with prospective clients. Will these cameras give you worthwhile quality photographs? Let's think about who will actually use the cameras - most likely either kids or somewhat inebriated guests are the ones drawn to them. As a rule neither of these groups make good photographers. Each disposable camera will cost you about $6. Let's say you have 15 tables at your reception. After the event or wedding each of these cameras will have to be processed and printed. The average cost of processing and printing each camera is $8. This may not seem like a lot of money, but think about this for a moment. What kind of a quality image do you expect to get from a $6 camera, made of plastic with a plastic lens and a flash that has a range of about 5 feet? The answer is NOT GREAT! You will be very fortunate to get 3 good photographs from these 15 cameras - which, if you break the cost down, works out to $70 per photograph! My advice - DO NOT WASTE your money on these cameras. Your professional photographer uses equipment valued at thousands of dollars to capture you looking your best and will certainly do a far better job than these disposable cameras. Receiving Lines - do you really need one?